Do local and state officials tune out when you try to talk to them about bicycling? Are they unconvinced by arguments about public health, transportation options, or clean air? Do business leaders send you packing when you suggest building new bike lanes and bike parking, fearing that the loss of car parking will keep customers away? Then show them the money. Bikes can mean big business, and businesses are beginning to realize it. At a Bike Summit panel Wednesday on the economic boost cycling can provide cities, speakers highlighted another strong message cyclists can bring to politicians when making their case for investment in bike/ped facilities. Far and away, the biggest reason business owners resist the addition of bike infrastructure is that they’re afraid it will limit parking. Once they realize they can get 12 bike parking spaces for each car spot, sometimes they begin to change their tune. Even better, they begin to discover that cyclists can be their best customers. “We tend to shop closer to home and shop more often,” said April Economides, a consultant who helped the city of Long Beach, California build bicycle-friendly business districts. Rather than jumping in the minivan and heading to the suburbs to go to the big shopping malls, cyclists patronize the businesses in our neighborhoods. That closeness has a dollars-and-cents value. Cyclists travel at what Portland Bike Coordinator Roger Geller calls a “human-scale speed” that allows them to “stop and buy something.” Besides, Economides said, if you’re car-free you’ve got an extra $6,000 jangling around in your pocket that you otherwise would have spent on gas and car maintenance (actually, $8,776 if you believe AAA). According to researchers with Intelligent Communities, a program of the National Building Museum, only 16 percent of household car expenses stay within the local economy. Free bike portraits, taken in a bicycle-friendly district in Long Beach. The four bicycle-friendly business districts Economides helped develop in Long Beach provide a model of how to encourage cycling without adding infrastructure. Local businesses see bike access as a boon for local shopping and dining. They have an informal merchant bike-share program, so the business owners themselves can enjoy the benefits of biking around town. The program created the nation’s largest citywide bike discount program, where customers get better prices if they arrive by bike. The program also brought the districts community bike rides, free bike repairs, bike valets at local events, and even free bike portraits, where you can get your picture taken with your bike (see left). The programs have brought a flood of new customers into participating stores. Two of the four districts didn’t even have a lot of good bike infrastructure to begin with – but there’s more demand for it now, even from businesses that used to be bike-averse. Long Beach got a stimulus grant to create the districts, and the term of the grant expired just last week. But Economides said participating merchants are now so jazzed about cycling that they’ll carry on the work. And it’s a diverse group of businesses: Organizers reached out to Spanish- and Khmer-speaking merchants in the area and got their full participation. They also left paper flyers and postcards on people’s doorsteps, since not everyone is wired. “Open Streets,” or ciclovias – events where streets are closed to motorized traffic and become the domain of bicyclists, pedestrians, skateboarders, rollerbladers, jugglers, dog-walkers – are another way to bring money to local businesses. Washington University in St. Louis was able to quantify the economic benefit of Open Streets programs: 73 percent of Open Streets participants spent money at a restaurant or store on the route, and 68 percent became aware of a restaurant or store that was new to them. Business Improvement Districts are another good place to seek support for pro-bike policies, said Andy Hanshaw of the San Diego County Bicycle Coalition. Local shopping and dining is what they’re all about, and they might be happy to sponsor community bike rides and new bike parking. After all, in downtowns turning car lanes over to people can be a great moneymaker. Its most stunning success, perhaps, has been Times Square, “the ultimate end vision of how to pedestrianize the most pedestrian-heavy place in America,” according to Mike Lydon of the Street Plans Collaborative. According to a recent study commissioned by the local BID, Times Square helps generate more than one-tenth of the city’s economic activity– on less than one percent of its land. From park(ing) day, where people create ephemeral parks in parallel parking spaces, to parklets that make those tiny parks more permanent, to pop-up cafés, adding outdoor public space draws people and adds life to the street. Those spaces also often become de facto additional seating for nearby establishments, giving them more capacity for free. Add to that the fact that bike lane construction creates about twice as many jobs as road-building for the same amount of money, and you’ve got yourself a great economic argument to take to local leaders and politicians when you ask them to support walking and biking – even (or especially) in tough economic times. We are pleased to work alongside Bike Saturdays in using discounts for cyclists as one more way to help sustain our counties, state, nation, and world. Great article, Tanya! Here in NYC, we’ve had great success with the first wave of the Bike Friendly Business campaign, getting businesses to hang stickers in their front window that proclaim themselves a “Bike Friendly Business.” It was not hard to convince businesses – all I had to say was “Do you welcome the business of customers who arrive on a bike?” Answer: YES! “Have you noticed more folks riding to your store lately?” Answer: YES! Final question: “Would you like to become a bike friendly business: most often, the answer was YES! Way less cargo capacity on bicycles compared to automobiles. @96f349e8b6a15ade91901dc135acc313:disqus douglasawillinger Is that an advantage or a disadvantage? I stop at the grocery on my way home. It’s like 30 feet off my path. I walk my bike into the store, fill the basket with heavy stuff like drinks, buy other stuff that goes in my back pack. After paying I’m out the door and riding again. In contrast, If I have to circle for parking or park at the far end of a lot, pffft! Why bother, I can go a few days without Diet Coke. Bigger trunk != greater convenience. There’s a restaurant nearby that recently replaced a single automobile parking spot pout front with a bike corral. The place is always packed. The corral always has 10-12 bikes locked in it (as does the nearby bike rack). That’s 10-12 customers. If it were just a parking spot, that’s 1, maybe 2 customers. 4 customers an optimistic upper limit. What a smart business, to remove a car parking spot and install a bike corral! KillMoto, love some bike corrals!!! We have to think in terms of how many Customers can we fit not how many cars, and bikes give the biggest bang for your buck! We want to install bike corrals on 9 th avenue, but the DOT tells us not before 2013 !!!! Check out the Streetfilms “Copenhagen Cargo Bikes” to see the incredible schlepping potential of the bicycle. On my bike with an Xtracycle I routinely carry home five bags of groceries along with a twelve-pack of toilet paper. In the past some of the loads I have carried are two lawn chairs, a Kentucky Derby hat in a huge hat box, irrigation tubing, two preteen girls, six iron Japanese tea pots, and a Tai Chi sword. I have ridden next to people carrying surfboards and cellos on bikes. Mostly I just use my regular bike with two panniers to haul home what I need. I have definitely changed my shopping patterns so as to patronize stores I can bike to. When stores and restaurants have bike racks out front, I am more inclined to think they are bike-friendly and feel I am welcome. Thanks for the statistic that only 16% of car-related expenses stay within the local economy. As gas prices rise, communities organized around cars where walking and biking are a nightmare will find their economies drained as more and more of everyone’s wealth goes toward carting their 5000lbs of steel around. Communities that make walking and bicycling pleasant will find that their citizens have more money to spend and that they spend that money locally. Tanya~ Thank you so much for taking interest in our BFBD panel and for such a great article. Mari and Ben~ Kudos on your discount programs. From what we’ve researched, NYC’s is the largest program and it spans five boroughs, Monterrey has the largest countywide one, and LB has the largest citywide program. I hope our success in this area inspires other cities, counties and regions to start and grow theirs even larger! Hope to meet you both in person soon – come to Pro Walk/Pro Bike in LB! 12 cyclists or one motorist for your customer base: Which would you choose? The 22nd Annual Sea Otter Classic (bike races, recreational rides, expo, and festival), Bicycle Leadership Conference, Interbike IBD Summit, and a California protest ride about distracted driving all take place in Monterey County in April. We’re grateful to have so many bike-friendly businesses all rolling out the red carpet for cyclists next month, and year-round. Oh, I guess all those merchants didn’t think of that and are actually going broke, and merely imagine that their sales are up. Or, maybe people don’t need three passenger seats and a trunk for every purchase they make and so your comment is irrelevant. Thanks, Mattymat. In Tips for Bicycling Monterey County’s “Why Bike?” section http://marilynch.com/blog/tips-for-tourists/why-bike I have a link to Bikes Belong’s stats. Now there’s a link to West Hollywood Bicycle Coalition’s summary too. I hope the city government of London will read this article. I’m a bit tired seeing ho busses are stuck following bicycles, just because there is no other lane for them. Get the right equipment and your bike will carry anything that you need! When I ride my bike I get hungry and thirsty, so I will stop at any local convenient store or eatery. It is not that hard to explain to the commerce folks. Just back from Cape Town where 35,000 cyclists plus an equal number of family members, support, etc. turned a quiet Sunday into the busiest of the year for all the towns and suburbs along the route. They really get it – a cycling event is good business! 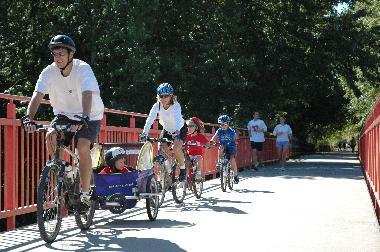 • Bike customers are healthier, which gives them more time and money to spend. Awesome! I live in a rural ag area w/ no bike trails and it’s downright dangerous to try to ride on roads w/ no shoulder! I have been researching bike trails in Sacramento, so I can go take a ride. But none of them seem to be near any biz disctricts to stop for a snack or beverage without having to go several blocks on streets (busy ones!). I’m not a fitness rider, per se, so would love to have trails that pass within a block of, or right through, places with cafes or shops that cater to the bike crowd. bike lane construction creates about twice as many jobs as road-building for the same amount of money…” Who’s with me? Dads push strollers, too. Otherwise, a great article. I ride my bike more, especially to True Value, the bank, Library,, and to the Carniceria. I ride slow and on the sidewalks on busy streets and in residential streets. I wait at the signals and cross like a pedestrian. No left turn for me. I ended up on Broadway going the wrong way on a one way bike lane. Screw that. My main fear is car doors opening or people coming out of shops with the doors on the sidewalk. I’ve got great legs, but those shorts for a younger person, don’t you think?. According to researchers with Intelligent Communities, a program of the National Building Museum, only 16 percent of household car expenses stay within the local economy.